These elegant wedding favor cards are the perfect way to say Òthank youÓ and share your love with your wedding guests. Seeded gifts symbolize healthy new life, boundless love, and a strong supportive community. A ringing bell design will bring music to your friends and family with the good news! 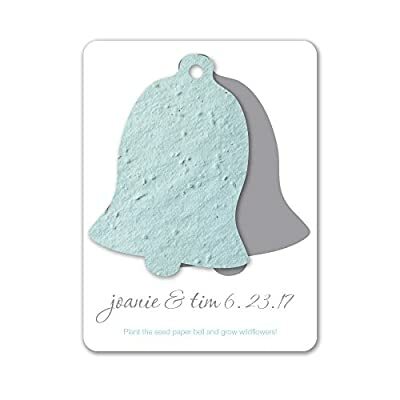 Our eco chic design is printed with eco-friendly inks on a 100% recycled 3x4 cardstock card and includes a 2x2.8 inch seed paper bell that will grow into wildflowers when planted. Just plant, water, and grow! The wildflower mix includes: five spot, candytuft, baby blue eyes, Siberian wallflower, scarlet flax, zinnia, sweet William pinks, corn poppy, spurred snapdragon, catchfly, English daisy, back-eyed susan, and forget-me-nots. CUSTOMIZABLE - Personalize your font, color, and text on these adorable seed paper wedding favors THE PERFECT WEDDING FAVOR - Sprouting seeds symbolize blossoming love! Send your friends and family these lovely thank you favors to plant a garden of wildflowers. They'll be reminded of your vibrant wedding day each time they look at these beautiful wildflowers growing healthy and strong. 100% RECYCLED PAPER - 100% post-industrial, recycled paper dyed with all-natural, vegetable-based pigments, made in a solar-powered production facility. EASY TO GROW - Just soak seed paper overnight, tear up, plant under a thin layer of soil, and water gently and regularly until seedlings sprout! HANDMADE IN THE USA - Our artisan seed paper and cards are created by integrating some of the world's best practices in papermaking with our own homegrown innovations, right here in Boulder, Colorado.